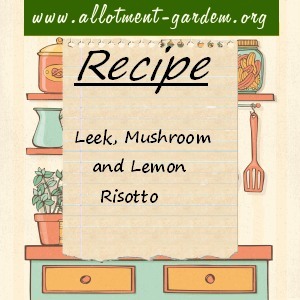 A delicious vegetarian risotto that is full of flavour and has a zingy, zesty taste. Wash the leeks well. Slice in half lengthways and roughly chop. Wash the mushroom and dry with kitchen roll. Roughly chop. Heat the olive oil in a large saucepan and baste the crushed garlic for a minute or two. Add the leeks, mushrooms and plenty of seasoning and cook over a medium heat for about 10 minutes until softened and browned. Add half of the butter to the pan and cook the onion over medium heat for about 5 minutes. Stir in the rice and cook for about a minute. Add a ladleful of the hot stock to the rice and cook gently, stirring until all the liquid is absorbed. Stir in more liquid as each ladleful is absorbed. This will take about 20 to 25 minutes. Return the leeks, mushrooms and garlic to the pan. Stir in the remaining butter, grated lemon rind and 3 tablespoons of the juice. Add half of the parmesan and herbs, stir and adjust the seasoning to taste. Serve, sprinkled with the remaining parmesan and herbs.